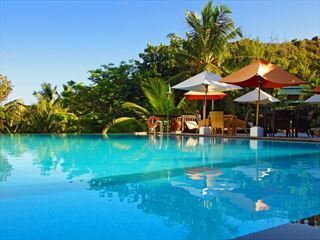 Lemuria is a beautiful elegant resort set in magnificent lush grounds and offers the ultimate in relaxing luxurious comfort. 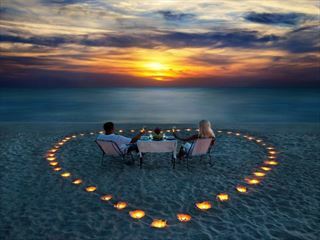 This luxurious elegant hotel offers privacy and relaxation in its beautifully built suites just meters from sandy beach. A charming hotel suitable for couples and families, it is owner managed and has an excellent reputation for food and service. 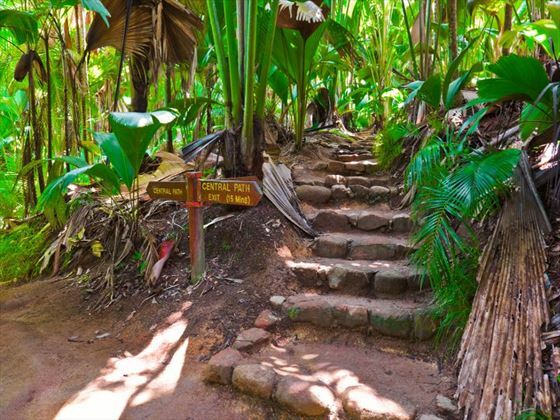 These luxurious bungalows nestle on a hillside overlookiing a private beach on Praslin island, and is a small, intimate property ideal for honeymooners and anyone seeking peace and tranquility. 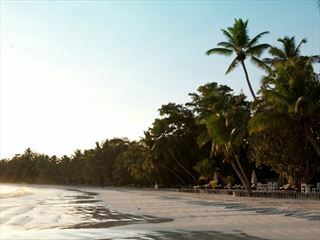 This charming and stylish hotel offers a delightful tropical location by the sea. 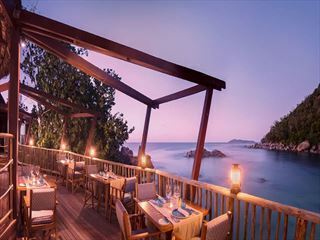 Backed by green hills and fronting the Cote D’Or Beach on Praslin Island, it is composed of 80 rooms in chalet-style buildings. 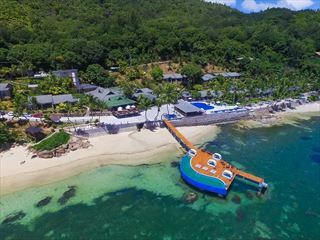 Guests enjoy a wide menu choice in the 2 restaurants, plus entertainment most nights, a games room, fabulous swimming pool and water sports with PADI certified dive centre. 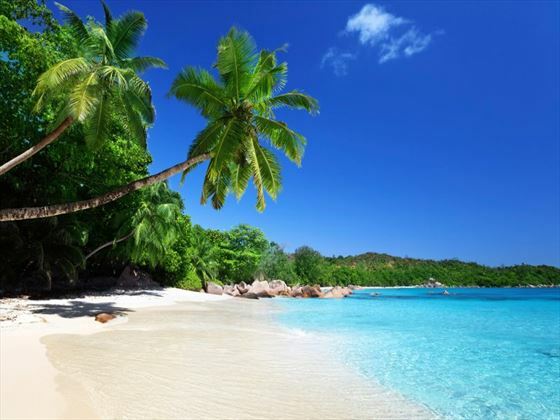 The second largest island in the Seychelles, Praslin is a stunning island covered in impressive jungle greenery, and fringed with powdery sand beaches. 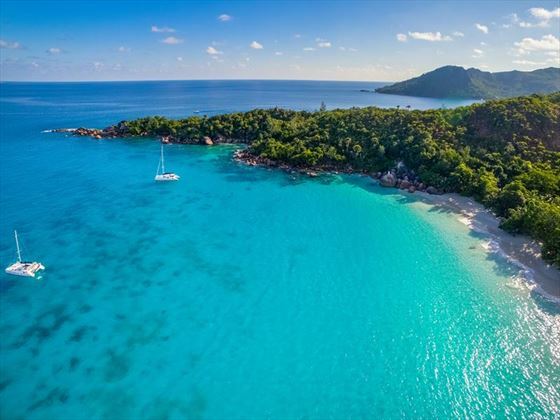 Anzio Lazio, northwest of Praslin, is one of the Seychelles’ most beautiful beaches, offering an unspoilt myriad of turquoise waters, pristine white sand, towering granite boulders, and thick palms and takamaka trees. 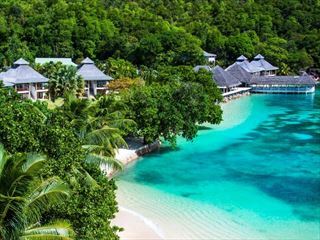 It never feels crowded here - despite being a popular spot for snorkelling, its crystal clear reefs are home to an abundance of tropical marine life, and the island’s small population and tranquil ambience offer the perfect laidback holiday. There are a wide range of hotels here - from the luxurious 5* resorts, to the more family-friendly beachside hotels, you’ll be sure to find something to suit your taste. With so many fabulous amenities, close proximity to the beaches, and plenty of delicious restaurants, there’ll be enough in each hotel to keep you occupied. 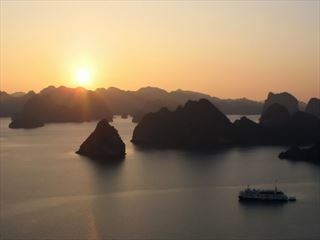 However, should you emerge from your hotel, there’s plenty of incredible flora and fauna to be seen too. 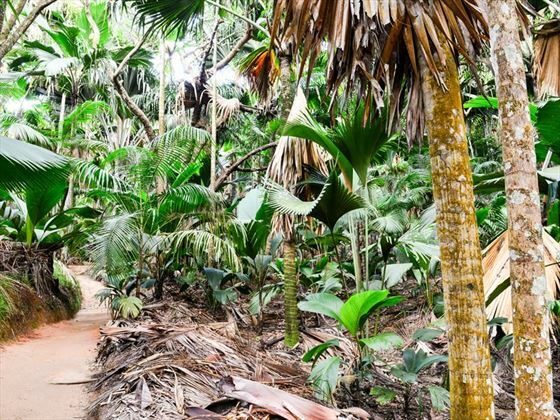 Vallee de Mai, a brilliant UNESCO World Heritage Site, is home to the largest intact forest of coco de mer palms – a rare species of palm trees endemic to this luscious island. Its erotically shaped coco de mer nut is the largest seed in the world, with some coming up to a whopping 30kg, and a visit to Vallee se Mai will grace you with plenty of facts about this fascinating plant. 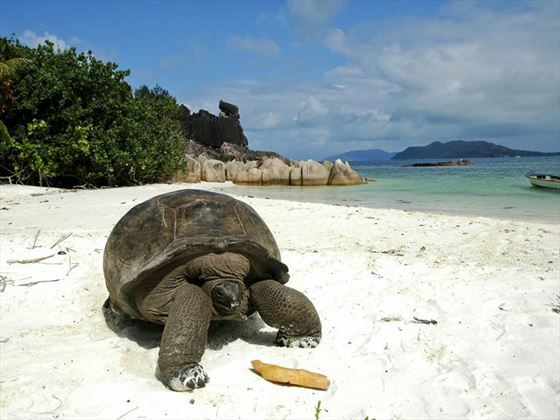 The island is also home to beautiful fauna, including fruit bats, the rare Seychelles Black Parrot, green day geckos, and Seychelles skink (an indigenous lizard), and you’ll be sure to spot some of these elusive animals. 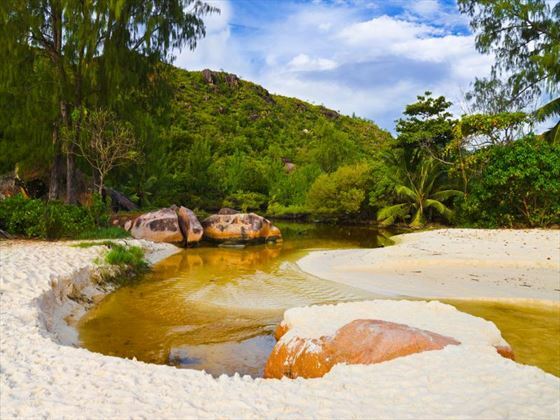 It’s incredibly easy to visit the islands close by to Praslin, offering a new landscape to explore before heading back to your luxurious retreat. 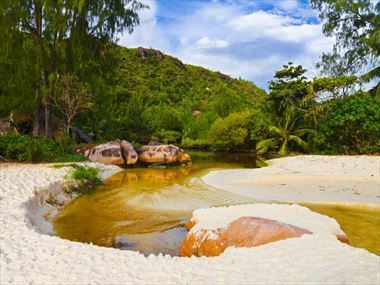 Arid is a particularly stand-out island, a natural reserve host to the biggest population of birdlife in the Seychelles, or it’s only a 10 minute ferry to La Digue. Praslin is also home to the only 18 hole championship golf course in the Seychelles, located in the lavish Constance Lemuria. 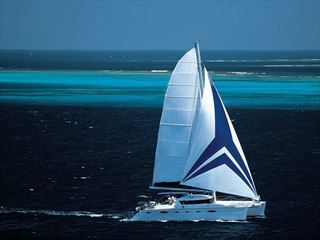 There are a wide variety of things to see and do whilst staying in Praslin. Check out our travel guides for some of the highlights, top tips and travel inspiration from our Tropical Sky Experts, along with some essential information you may need for your holiday. 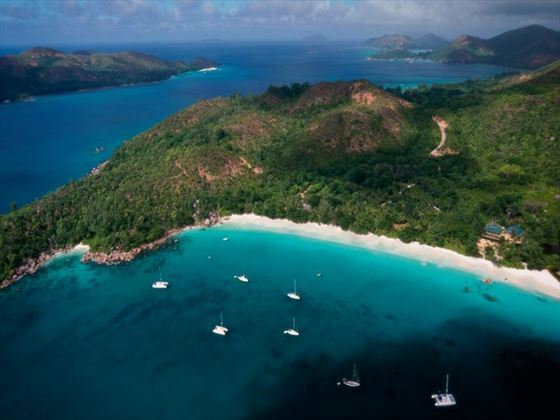 Coupling sensational beaches with verdant jungles, Praslin is a beautiful island with so much to explore.